"Unfair to other parties": The Commission on Elections has reportedly denied the Liberal Party's request to extend filing of their Statement of Contributions and Expenditures or SOCE. Broadcast journalist Erwin Tulfo broke the news Wednesday night, June 15. "BREAKING NEWS: Hindi tinanggap ng COMELEC Campaign Finance Office ang apela ng Liberal Party na palawigin ang deadline ng pagpasa ng statement of contributions and expenditures sa nakaraang Eleksyon 2016. 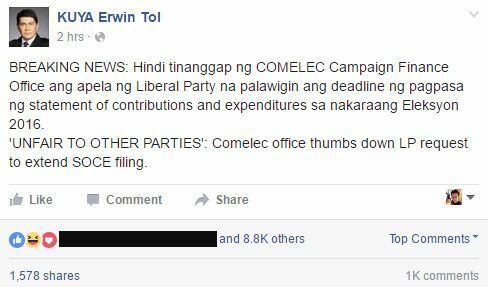 'UNFAIR TO OTHER PARTIES': Comelec office thumbs down LP request to extend SOCE filing." The LP submitted its campaign spending report last Tuesday, June 14, six days past the June 8 deadline. In its SOCE, the party reported a total of P241,097,372.73 in both contributions received and expenses incurred throughout the campaign period for the 2016 national and local elections. However, the law requires all candidates, party lists, and political parties to submit their SOCEs within 30 days after election day, or June 8, 2016, regardless of whether they won or lost. Section 2, Rule 10 of Comelec Resolution 9991 clearly states that the "08 June 2016 deadline shall be final and non-extendible" and "Submissions beyond this period shall not be accepted." 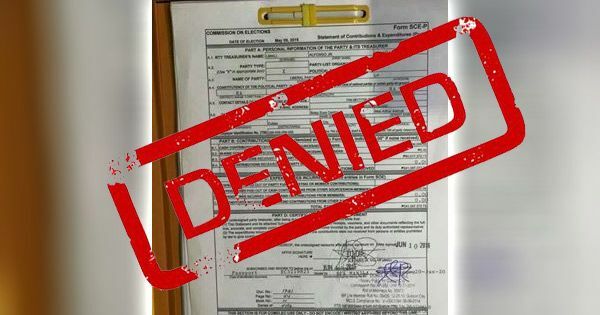 Because Comelec denied the appeal as reported by Tulfo, the fate of Vice President Leni Robredo, Senators-elect Frank Drilon, Joel Villanueva, Leila de Lima, Sherwin Gatchalian, Riza Hontiveros, Francis Pangilinan, and other governors, mayors, and councilors under the LP ticket are in peril.